Monica Harlow looked around at the people lined up to run the 26.2 miles of the Rock and Roll Marathon in Phoenix. “Every one of these runners has a story,” she thought. “Everyone is here for a reason.” Perhaps none more so than Monica herself. Nine years ago, Monica could run only a short distance before running out of breath. She wasn't too worried. She’d played field hockey in high school, was thin and had always assumed she was healthy. Still, when she and her husband started thinking about starting a family, Monica decided to have a physical. Her family practice physician noted that Monica had a heart murmur, which she’d known about since childhood. Most heart murmurs are harmless, and none of Monica’s physicians had ever been concerned about hers. But, her physician referred her to a cardiologist, just to be safe. That appointment began with an electrocardiogram and ended four hours later with a shocking diagnosis: Monica had an atrial septal defect — a hole in her heart — and was in heart failure. She was told she would need a heart and lung transplant. She left the appointment with an oxygen tank. “Everything changed for me that day,” Monica tells us. In the whirlwind months that followed, Monica’s cardiologist suggested she get a second opinion. 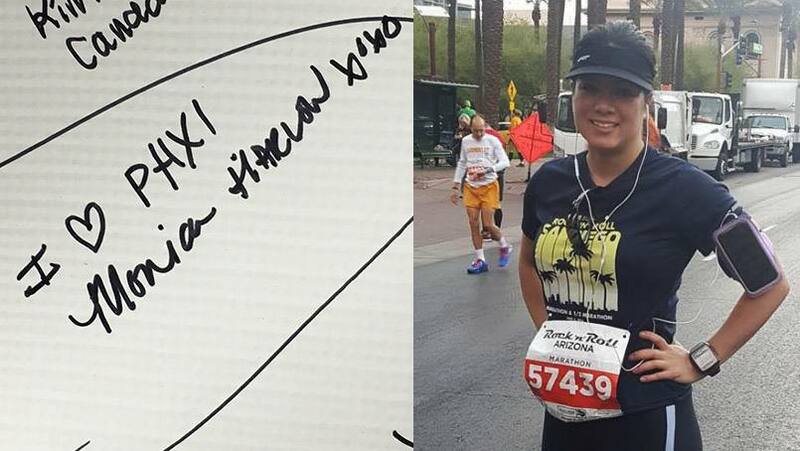 That led her to the Adult Congenital Heart Disease Program – a collaboration among Mayo Clinic, Phoenix Children’s Hospital, and Arizona Pediatric Cardiology Consultants. After meeting with Eric Steidley, M.D., a transplant cardiologist at Mayo Clinic, Monica’s life changed again. Dr. Steidley told her that her heart defect could be corrected surgically without a transplant. That corrective surgery took place in August 2008, and not long after, Monica was cleared to return to any previous activity. Including running. On Jan. 15, Monica ran through that city, thinking of the many miles she’d covered, as well as those yet to come. “For me, this race was a closing chapter and the start of something new,” Monica says. She tells us that she completed the race ahead of her goal time, and is already making plans to return. “I’m thinking this may become an annual event for me, either to run or cheer others on,” she says. To that we say, run Monica, run. Race to leave a comment below. Then you can use the handy social media tools atop this page to share this story with others.